KEI is proud of its achievements in facilitating education abroad for all students. Thirty percent of our program participants are African-American and Hispanic-American, compared to fourteen percent nationwide (Council on International Educational Exchange). Close to eighty percent of our students receive the Pell Grant. And, more than twenty percent major in a STEM discipline. From the beginning KEI worked closely with public and minority serving institutions to service ethnic minority students who traditionally do not study abroad. KEI has formal agreements with more than fourty Historically Black Colleges and Universities (HBCU) and Hispanic Serving Institutions (HSI). In many cases, our partnerships go far beyond student mobility to include curricular integration and faculty development. KEI’s first and current Universities of Record are HBCUs – Clark Atlanta University and Lincoln University of Pennsylvania, respectively. KEI’s affordable and inclusive program fees coupled with generous Affiliate and Travel grants enable many students to pursue their education abroad goals. We treat students as individuals and work with their families on deferred payments and interest-free payment plans. KEI’s discipline-specific study and intern abroad programs offer a wide selection of courses (in English) in a range of academic subjects including science, engineering and computing. Our first program concentrations were Medicine, Health & Nutrition and Science, Math & Engineering. Since then, KEI has expanded its concentrations to include psychology, business, foreign languages, social sciences, criminology, sports, communications, media, performing arts and many others. Half of KEI’s program offerings are in non-traditional locations, including Eastern Europe, Asia, Africa and Latin America. Our first programs were opened in Russia (1997), China (1999), Kenya (2000) and Thailand (2001). Today, KEI offers semester and summer programs in eighteen countries, and organizes faculty-directed programs in more than 30 countries. KEI is committed to making education abroad accessible to all students, regardless of their academic major, financial means and ethnic background. Thanks for allowing me to utilize your program! It has opened my horizons as a scholar and broadened my perspective as an African-American. I’ll remember the experiences, people and most importantly the knowledge that I acquired while studying in Burgos. I couldn’t thank you enough for granting me the KEI Travel Grant. KEI has really been a life altering experience and I’m happy that you allowed me into your wonderful program. I would like to keep in touch for advice and possibly to talk about future endeavors. 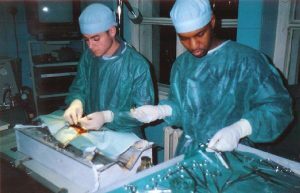 My medical internship was outstanding. The doctors showed me how to perform intravenous injections and I actually administered shots to patients as if I was a medical student. They’re not afraid to really give you hands-on experience. It’s an authentic environment to really practice and learn Spanish as well. I am so thankful for the medical internship I had in Ecuador with KEI. It will set me apart from other applicants to medical school. My time in Ecuador couldn’t have been better! I absolutely love KEI. I compared KEI with CIS and AsiaLearn and not only is KEI more affordable, you get much much more for your money. KEI makes sure students are well informed and looked after before and during their study abroad experience. And, teh cultural excursions were well prepared and amazing. I want to thank KEI and View (KEI Onsite Director), for everything you did for me. I will continue to promote KEI to everyone I know. If only you offered a grad school program and I promise I would be the first to apply. Thank you again! My internship experience in London was empowering. I had never worked in environment that was so diverse: people from Ethiopia, Germany, France, etc. I loved the idea of being responsible of projects and exploring it alone. I worked on the projects and had weekly meetings with my boss to present. That was challenging and yet empowering! This internship made me realize that the city itself enhanced my work experience. The diversity of a city is crucial for me to keep growing. In London, immigrant communities contribute to a multicultural city compared to Minneapolis (where I live).